Whoever designed Islamabad must have had Europe in mind as it would have made a beautifully green city environment. What they forgot to take into account is that in this part of the world not everyone has enough money to firstly own a house and then if they do, the concept of maintenance is valued little. Consequently, lining the roadsides in between the main sectors are scores of really filthy tent villages. The apartment blocks and housing making up a large percentage of the "working class" area are also considerably decayed and in such a state of ruin that you can hardly believe this city is only 40 something years old. The other side of the coin is the business and governmental sector, which in all its pomp and grandeur stands out like a sore thumb against the poverty of the everyday folk. After coming out of Aabpara, where we are camping, it is almost like taking a taxi ride through fairy tale land: so green and perfectly pristine; white marble and cool fountain courtyards. The more affluent area of Jinnah Super Market has some pretty good examples of upper class Pakistan as well. Besides the brand-name clad inhabitants, internet cafes can cost four and a half times the price of other areas. Though the extra cash will get you a virus free computer. Icecream parlours sell 3 scoops for 160 rupees, whereas you can purchase the same quantity in the Blue Area's Food Mall for just 45 rupees. The other difference being, instead of lounging on stylish wrought iron framed seats, you'll have to battle for a free seat in a giant upstairs food court. What we find most tiring about Islamabad is the need to be constantly on the ball. You have to check your dockets and your change thoroughly, be prepared to barter hard with taxi drivers and although it is a complete pain in the neck, walk away when you don't get the going price. You shouldn't need to pay more than 60 rupees within the main city grid. After spending every breakfast for nearly two weeks and half of our evenings eating dinners at the Ambassador Hotel, we notice that the staff have been diddling the bill. Stupidly, we had trusted them after the receipts from the first couple of nights were all in order. We simply went on paying them the verbal total plus a tip after each meal. One night though, it strikes me that it is very expensive for what we have ordered. Years of waitressing work pay back later at the campground, when I rattle off the food and prices of everything we had ordered for the past four evenings. It seems that these guys have been pocketing between 100 and 200 rupees each time. Which is not much in European terms, but here it is a lot and regardless of amount, they have no right to do this. We decide to see if they will slip up one more time and await the bill after our last meal at the Ambassador restaurant. Unaware of the trap, the waiter quotes more than what he should and when confronted with this and the fact that he has been doing this for the length of our stay, this staff member suggests paying us back. We decide speaking with the general manager the following day is a better idea. Even though, he tries his best to be grateful for "bringing this matter to his attention" as he puts it and refunds the discrepancies, we are not quite sure if anyone in this hotel understands the real issue at hand. It is not about the money, but about trust. We donate half the refund to the door staff and the other half to Kiva. On the Santiago de Compostella trail again? It feels great to finally leave Islamabad. Indian visa in hand - even though we don't get exactly what we had asked for - the 6 month double entry is good enough for the first leg of our journey. Today is also pleasantly overcast until around 1.00pm. After that, we find ourselves catching any bit of shade the trucks can give us while cycling up the inclines. The roads are pretty okay, so we average a good 18 kilometres per hour on the reasonably flat terrain. It is a little slower than the hoards of Christian cyclists, mostly from Peshawar and Islamabad are doing when we bump into them. I can't stress how very strange this concept and chance meeting in Pakistan is. While they may initially appear to be travelling faster en route to a festival some 30 kilometres from Lahore, at the end of the day, we make our destination well before nightfall and they are still hours behind us. Perfect Turtle and the hare story. Too many recuperative breaks needed and not enough steady pace. They do have the most intriguingly decorative bikes though. There are plenty of shops and pit stops along the road to Dina (105km; 44m), which we arrive in around 5.00pm. A bustling town with two hotels right next door to one and other: 1500 rupee rooms on the left hand side and 500 rupee staff quarters on right hand side. No questions about which one we choose. The restaurant food is excellent. Again, we wake to overcast skies and it lasts the whole day which is a true blessing, since we plan to travel 130 kilometres to reach our destination today. There are a number of hotels along the way, should anyone want to stop off in the rather poverty stricken villages. This part of Pakistan is really not at all pretty. We pass township after township of rubbish laden streets, market stalls and buffalo alike swallowed by muddy water, discarded ceramics strewn across factory frontages and stagnant water patches that make me dry reach from the stench. This landscape is a good indication of some of the problems facing this country. Ali is once again the centre of attention as we pedal along the highway and he is constantly in conversation with someone. I sit behind, quite unnoticed which suits me fine most of the time. We roll into town Gujranwala (130km; 228m) and stop to find accommodation for the evening. I wait near the taxi stand and become engulfed by men who refuse to shake hands with me, but want to know everything else about me. Ali rescues me from the crowd and as we venture in the direction of a supposed budget hotel, we are escorted by an entourage of curious locals on bike, motorcycle, auto-rickshaw and car. Ali gets talking to a man on a motorcycle, who turns out to be our host for the evening. He very generously offers us a room in his well-to-do place befitting of the upper-class suburb just a few kilometres out of town. We are fed all sorts of delicious foods which I am permitted to consume with the men, but at the same time we are interrogated about our atheism. It is a little difficult to explain to a highly devoted Muslim that love can and does exist outside religion. Though his son gets a little annoyed with his father, the early morning preaching at the breakfast table goes in one ear and out the other without further indigestion. After the photo session and thanking our hosts for their kind-hearted hospitality, we ride back to the main road leading to Lahore. The roads are really bad on this stretch and the closer we get to our destination, the more the smog inhibits your view. Headache causing exhaust fumes are pumped unrestrainedly into the air from every conceivable form of transport and a deafening chorus of horns is blasted every free moment the driving hand gets. It stinks and it's hot. It's way too busy for comfort and it's total chaos. Finding Afzaal Tourism Family Guest House is a little harder than we think, though well worth the effort as Wadhat Colony is quite a pleasant retreat away from the very dusty, over polluted city centre of Lahore (75km; 51m). Furthermore, there is all you need as far as restaurants, market stalls, bakeries and convenience stores on Wadhat road, just a ten minute walk from the guesthouse. Since meeting the Christian cyclists and discovering the effect of the air pressure horn, we've been toying with the idea of buying some ourselves for the bikes. We figure, if we can't beat them, then we'll have to join them. 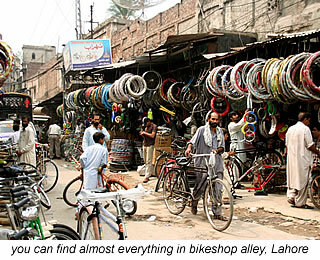 A trip to bike alley in Lahore to purchase these high decibel devices is a real treat for any bike enthusiast: everything and anything to do with this mode of transport: tubes with car valves are pretty expensive though. We decide to do a couple of touristy things in Lahore, even though our disappointment with similar efforts still smarts a little. Unfortunately, there is little difference from our previous experiences and once again you find yourself forking our big money (on a Pakistani scale) for poorly cared for attractions. The museum, with a sign boasting its status as one of the 10 best museums in the world leaves quite a lot to be desired. It is famous for its Ghandara statues and the most well-known is the rather scarily gaunt, but expertly crafted sculpture of the fasting buddha. While these artifacts are quite interesting, the problem lies in the badly displayed and labelled cases, some pieces having only the information: circa 20th century. This doesn't really show much initiative on the curators behalf. Even so, it is an eclectic collection of goodies; just a pity I couldn't learn more about each piece. 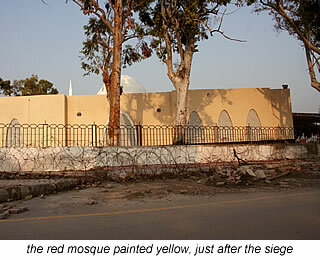 The fort - also a wonderful architectural structure and obviously an important part of Lahore's history - is full of what were long ago beautiful frescos and tiled walls, though they are hardly recognisable now with the amount of graffiti covering them. It costs 200 rupees for foreigners and locals pay 10. Inside, we are also offered to fork out a further 100 rupees each - which we decline of course - if we want to look behind the wire fencing shrouding the once stunning mirrored walls. The other, much talked about place to visit is the old city. It is like stepping back a few hundred years in history, which is fine if you like seeing just how primitive people really can live. The best part of today's outing was meeting Julie & Ian and our impulsive plan to cycle to the Wagah border together. We meet Julie & Ian at the corner of Canal and Mall Road and after mending a broken spoke on my rear wheel, we easily ride out of Lahore along the canal where bathers and water buffalo cool off together in the hot morning sun. We make it to Wagah (30km; 30m) around lunch time and sit the afternoon away, sipping on Mountain Dew soft drinks and chatting with the infamous guy who has a small exchange book stall at the border. There is little else to do, except wait until the border ceremony at 5.30pm. It is the day before Ramadan starts and ample reason for the Pakistanis to flock to this event. A lot of quite bizarre goose-stepping, indignant strutting and impertinent facial expressions can be seen on both sides of the gate. This outlandish display of pomp and resonant formality takes about 40 minutes in total and leads us all to believe that the guards definitely have personal copies of John Cleese's "silly walks" skit. In any case, there is certainly enough drama going on to warrant keeping a team of choreographers constantly planning new moves. Needless to say, the ceremony is well worth the visit and pretty much the highlight of our southern Pakistan journey. A piece of advice, if you are crossing from Pakistan into India, you may as well stay in the hotel at the border. It is only 700 rupees for a double with a fan, whereas a taxi journey from Lahore to Wagah is 1100 rupees for two persons. Just check your bed sheets and demand clean ones if there are one too many black hairs present. Food in the restaurant is a little wanting, but there are good food stalls outside, though it pays to be early. Everything closes pretty quickly after the ceremony. The second highlight was the pack of Douwe Egberts coffee and plunger that Ian & Julie pull out of their luggage. Mmmmmm...Douwe Egberts, now that was a long time ago! When the pseudo toast - bread slightly tinged over the gas hob - lands on our table the next morning, we are all pretty disappointed. But hey, these are our last hours in Pakistan and hopefully the Indians have learned more about how to make this English breakfast favourite. The bureaucratic procedures turn out to be a piece of cake. A friendly Pakistani official asks a few questions and is impressed by our 7 week stay in his country. The exit stamps are in our passports before we know it and we trundle down the path towards the Indian immigration office while snapping a few photos along the way. We may as well take advantage of this privilege, as it is probably the last time it will be permitted. A couple of forms later and we are free to ride the very short distance into Amritsar (33km; 53m). The city is quite hectic, but we manage to find our way to the Golden Temple by following the signs. Our plan is to stay one night at the temple complex and then see what the rest of the town has on offer as far as accommodation is concerned. But as there are only three bedroom dorms available - and that doesn't suit either parties - we ask at the first hotel we come to at Bharam Buta Market near Sri Guru Ram Dass. A double room is 450 rupees with fan, but the owner goes down to 400 [at the time of writing, 56 rupees = 1 euro, but this can go substantially up or down]. Sachdeva Guesthouse, just next door has similar rooms for 250 rupees, which proves yet again: it pays to shop around. A taxi from Amritsar to the border costs just 60 rupees per person, so the four of us catch one back there to see the closing ceremony from the Indian perspective. Although it is experienced by 10 times the crowd, it doesn't really have the same impact as the Pakistani display on the night before Ramadan. We say goodbye to Ian & Julie who spend just two nights in Amritsar before heading towards Delhi. We remain for one more prior to braving the mountainous climb to Upper Dharamsala. It had been great riding the short distance with them chatting about the same things that always consume cycling travellers' conversations: kilometres, safety, road conditions, bike parts, handy tips, travel insurance and always interesting, the identical but disputable issues that rise between touring couples. It is obvious that men are stronger than women and there's nothing either party can do about it, except for live with it. Amritsar is an intricately networked town crossed between well-planned tourism, sacredness and impulsive mayhem. The twist comes as soon as you leave the tout infested streets to enter the sublimely peaceful Golden Temple. This is especially true at night when the golden gild and lights shimmer its beauty in the structurally contained lake. Going back there during the day - though still quite a meditative refuge - it doesn't quite exude the same feel as a night time viewing. Possibly due to it being the weekend, but we have to wait for a long time in the cramped queue before the temple which contains the Adi Grantha, the sacred scripture of the Sikhs. As we draw nearer the entrance, the pushing begins. Chanting becomes more frenzied, eyes half-close and hands go up in prayer. In turn, clusters of people are thrust forward into the overly-crowded, richly ornate Hari Mandir. Within the jewel studded glitz and golden gilding, a band sings a mantra while Sikhs' eyes roll back in their head as if unconscious. The mass swaying shoots waves that impel the crowd to move uncontrollably from side to side. I actually find it a scary, suffocating experience and after forcefully pushing myself outside the shrine, take solace in the fresh air and freedom of movement. It is much more my scene to sit contemplatively on the side of the peaceful waters, w2here you must remember to never point the soles of your feet towards the temple; or anything sacred for that matter. Looking forward to getting up into the mountains to cool off, we quickly discover that to get there, means a lot of hard cycling work in store for us. The roads are not always good, especially in and around the townships, but it has to be said that compared to Pakistan, the highways are impeccable. Another striking difference between Pakistan and India is enterprise. Though it still happens, in this region there seems to be is less "hanging around" by the male population, doing absolutely nothing at all. Apart from the beggars of course, who either have a reason to or have created - generally by self mutilation - a good enough reason to loiter, the rest of men are quite the entrepreneurial salesmen. The "there-is-always-something-to-offer-in-exchange-for-a-few-rupees" attitude reigns here. Ali and I however, have differing opinions about which country is friendlier. I have to say - on first glance - India. It has been a very long time since I have seen couples holding hands in public, let alone touch one and other. Both men and women smile here and although still quite conservative - it would be nice if a few blinkered travellers would take this on board too - it is not halfway near as inhibiting as in Pakistan. Ali on the other hand has had to come down a notch. In strict Muslim countries he was always the centre of attention, king of all kings and especially so when travelling in Pakistan with two females on bikes. Most thought he had a couple of wives in tow. One thing we both agree on though, are the appalling manners in traffic. In the coming days, our air horns will be used to the maximum, our voices taken to decibels over and above what we think are our actual abilities, Ali will be nearly wiped off his bike on two occasions and I'll be aimed at by a frustrated driver, made to stop on a 10% incline for a greedy inconsiderate van chauffeur to make a u-turn and actually hit by a school bus along the way. The last, luckily not resulting in serious injury, but certainly an incident shocking enough to make me cry and begin the growing despise for all Indian drivers. We also learn that when confronted with their inexcusable lack of respect, they are cowards and go running for cover. They know full well that they are in the wrong, but somehow the size of their vehicles gives them the go ahead to turn into a perilous road-hogging tyrant. Cows wander aimlessly about and traffic swerves expertly around them. It is a pity they don't do the same to a couple of cyclists on loaded bikes. I've suggested getting t-shirts made with "I'm a holy cow" printed on them, but Ali thinks it won't do our cause any good. 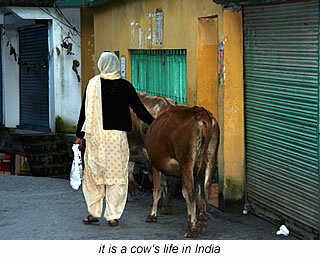 Apparently, while Indian standards permit the near killing of a cyclist, using the cows name in vain is blasphemous. The ride out of Amritsar is confusing and we need to ask at every intersection - which is a lot of asking - until an inconspicuous signpost is spotted by Ali indicating the way to Batala. Not one photograph is taken today, which kind of explains the degree of fascination with the ride:flat, boring; monotonous; hot and considerably sweaty. We just keep pedalling until we reach Gurdaspur (73km; 66m). Green Hotel is the first place we see and it is 300 rupees for a rather too well used room. Ali agrees it's quite a bit dirtier once inside than on first inspection. Still, there is a restaurant downstairs and a cold beer awaits us after the thirsty ride. As well as refreshing beer, our meal is pretty tasty considering it comes out of a packet. We enquire about breakfast and according to our host, eggs and toast will definitely be on the menu. Our breakfast eggs, we can forget about. Somehow though we were the only ones in the restaurant yesterday evening, they have all been miraculously consumed overnight according to the owner. It might well have been the rat scurrying away from our bikes in the downstairs garage as we climbed the stairs to our room. Toast we do get, but it comes in the form of a small loaf of white sliced bread still in the wrapper from its recent purchase outside. Plonked on a plate before us, I am left with no other option than to fish the peanut butter and marmalade stores from my back panniers. Today's journey is a little bit the same as yesterday's: an overcast beginning ending in plenty of sunshine and Ali's lack of stimulation to get the camera out. though that may also have something to do with his upset stomach. Since the cramps began in Amritsar he has not been the best of health. We hit a detour just out of Pathankot, due to a fallen bridge, which takes us in and about tiny villages on badly surfaced roads. We stop 4 kilometres before our intended destination of Nurpur at Jassur (67km; 262m). The town is just as uninspiring as Gurdaspur and the Shagun Hotel, complete with its little brown cockroaches, quite a turn off. After asking for clean sheets and pillow cases on three occasions, our room finally gains a tiny bit of civility about it. Common to both Pakistan and India is the half hearted way locals finish off their building work. Seats are often only placed on top of the toilet bowl, which can lead to an unwanted calamity if you are not careful; the taps are rarely ever fastened to their ceramic surround and half of them will not have water connected, which means you should always try them out while looking at the room; and light switches appear to operate someone else's electrical source; which leaves you in the complete dark about what you actually paying for. We are not far out of Jassur and the climb begins. It isn't too horrendous at first, but we appear to be going down almost as much as we are going up. This is not a good sign, since we need to be at 1700 metres or so if we want to reach McLeod Ganj, a mere 44 kilometres away. The scenery becomes more picturesque the higher we get and it is quite luscious and green in parts. Monkeys are running all over the place showing off their little red bottoms and we have found another use for our newly acquired bike horns. Apart from amusing the Indian male population of all ages, they work at scaring the advancing monkeys away, who are notorious for stealing away with loose bags. Cows lie lazily abreast the whole road, without a worry in the world. Six kilometres from Shahpur and we reach a split in the road. A storekeeper tells us either road goes to Dharamsala, so we choose the shortest route. It is an absolute killer to climb, but stories from locals say that the other road is just as bad. Sweat is dripping off in bucket loads. I have to stop quite regularly over the next 12 kilometres as we traverse from an initial height of 700 metres to an altitude of 1132 metres. My knee has started giving me a bit of trouble on the very steep bits and we end up quitting for the day only 4 kilometres from Dharamsala at Pine View Hotel. Sudher (31km; 1160m). A beautifully clean room with good amenities costs just 300 rupees out of season. Whatever the time of year, this is the place to come and stay for a relaxing peaceful time overlooking the mountains. There is not as much excitement about the view of the long climb in store for us tomorrow, but a very good reason to make good use of the comfortable bed with nice smelling sheets. After the first 1.8 kilometres we have climbed an incredible 120 metres and I know I'm absolutely exhausted when I don't even have enough power left in me to spit properly. It just falls listlessly onto my toe-clipped boot. The steepness doesn't let up either. Narrow and winding roads with bad edges continue to dish up a number of muscle crunching climbs at 10% plus; each well over a few hundred metres. Six kilometres from McLeod Ganj, and the signpost reads 1600 metres. We actually work it out to be around 1500 metres. The last few kilometres are easy in comparison to the earlier ascent and we make it into McLeod Ganj (13km; 577m) just after lunchtime and just before the heavens open up. The room we get is small, but adequate, though a little damp. There is hot water which is a wonderful luxury after so many cold bucket showers. It is noticeably cooler and considering only an hour before, we were sweating our butts off coming up the hill, it is quite an amazing contrast. The first impressions are of the degree of tourism this place harbours and the amount of Tibetan monks roaming around. You could donate your life away to one good cause or another in McCleod Ganj and before we know it, I am signed up for giving an hour and a half of free English lessons each day. Also keeping us busy is the task of building a website for our board and free wireless internet. The food here - and especially in Green Hotel - is quite delicious and the best we have had anywhere in the world, apart from a couple of places in Thailand that is. McLeod Ganj is streaming with foreigners and volunteer workers from all over the world, plus a few throw-backs from western society that have spent one too many months in India. Apart from being residence to the Dalai Lama and the headquarters of the Tibetan Government in exile, McLeod Ganj is a major tourist hub. This is obvious as you make you way along the bustling bazaar - best not visited on a Sunday - or down the winding lane ways brimming with restaurants, market stalls, convenience stores, video halls and shops full of Tibetan artifacts and handicrafts. And if that is not enough to keep you occupied you could visit one of the numerous museums or organisations dedicated to the Tibetan culture and refugee community. You could even dedicate some of your time to one of their causes, take a stroll on one of the many walks around the area, attend a massage, reiki or meditation session or even learn how to cook your own Tibetan meal. This place definitely caters for all walks of life. Though all these activities are pretty tempting, apart from the odd meander around town, we are preoccupied with other things. After the Green Hotel website is finished, this update is uploaded and we have eaten enough good food for it to no longer excite us, it is definitely time to get the feet back into the pedalling rhythm and our lives back on the road. The next path will lead us to Delhi. This should take about a week combined with a lot of concentration getting ourselves through the 13.7 million populated metropolis and one of the most notoriously tout-riddled cities of the world. We are already planning our personal toot messages for when we undoubtedly will get separated in traffic. In true Indian style, I'm going to scoop these four days together, throw them in an old rice sack, shake a bit of spice around and finish off with a little dash of rose water for fragrant measures. So much happens that we can hardly remember what happens, but one thing is for sure, the journey to Chandigarh and then further on into Delhi is like nothing else we have ever experienced and we hope that we never have to again. At the end of each day, we are mentally and physically exhausted and certainly not interested in smiling or talking to anyone; let alone trying to barter the price of the dirty grot box room with filthy bed linen down from some outrageous amount plucked out of the sky on the account of us being foreigners. We are incapable of little else than eating and sleeping, which we do with fervour. We can't even muster up enough strength to pull a horn zealous driver out of his vehicle by the throat and retaliate by screaming loud down his ear hole. Like the never-ending music clips here, drivers just don't know when to stop and as I find out pretty quickly, they also have a pretty warped sense of humour. Evidently, steering your truck head-on towards a female cyclist on the opposite side of the road, before swerving off at the last minute - all the while laughing your head off - is how the male drivers in this country get their kicks. This happens on one too many occasions for me to cope with it anymore and on a difficult incline on the way to Roopnagar, just after another one of these sad road assaults, I break down sobbing in full view of a curious, but unsympathetic clan of monkeys. For the first four nights, we stay in Top in Town Hotel in Joginder Nagar (86km; 1100m), Partap Palace in Mandi (58km; 641m), Kwality Hotel in Bilaspur (67km; 731m) and some shoddy joint whose name we can't remember, nor would we recommend in Roopnagar (92km; 1031m). 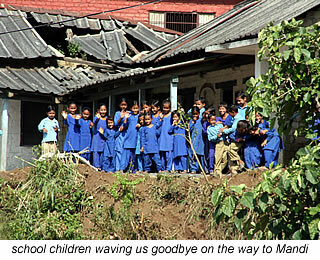 In fact Roopnagar, also known as Ropar is a frightfully dirty, sleazy and not a particularly pleasurable town. Prices range from 200 to 300 rupees per night. All our hotels are of mediocre standards and have their fair share of sociable vermin, massively fanged spiders, irritating insects and years of built up filth, with the exception of Kwality Hotel, which almost lived up to it's name and was, quite surprisingly, the cheapest place of the lot. Top in Town Hotel in Joginder Nagar obviously got its title for the restaurant food prepared expertly by a very proud and caring owner. Contrasting the horrible time we have been having on the cycling and accommodation front, the food in India is unbelievably delicious, varied and always available. There is an abundance of dhaba-style eateries or restaurants to get your food fill from in all towns and villages. As a vegetarian, it is just sheer luxury not having to ask that all important question: "Is there meat in it?" The 303 kilometre journey to Roopnagar is basically 3503 metres of uphill grind the entire way, with only a handful of welcomed downhill plummets to catch the breath on. We wind our way through tea plantations, corn fields, the tiniest and poorest of villages as well as a few larger, more frenzied townships. More than often, roads are not very good, but strangely enough when they are okay, they are excellent. We are thankful for the shade of tall luscious green trees entangled with tropical vines, wild mint and footed with dainty maiden hair ferns. Butterflies of dazzling colours and sizes flit between us and the other side of the road where brilliant yellow trumpet flowers adorn shrubbery inhibiting our view of the sheer drop below. The scenery here is pretty spectacular though we get very little time to enjoy it. It is eyes on the road and both hands on the handle bar terrain; while climbing in our lowest gears, we avoid collisions with buses, public and goods carriers, motorcycles, cars and anything else moving faster and more furiously than us. 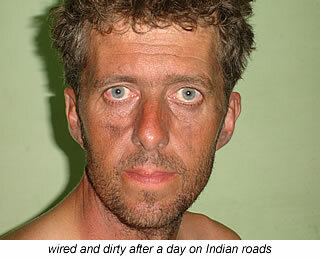 Ali receives a grazed elbow from one jeep that ventures to close to him, is pushed from the road incessantly over the length of the four day expedition until he reaches boiling point as a car overtakes from the opposite direction and leaving him no room to cycle. It comes close enough for him to swipe his side mirror off. We meet a group of Ozzie boys on Enfield motorcycles just before Roopnagar, spitting and cursing about the lack of courtesy on Indian roads. In Delhi a few days later, we also witness another traveller totally do his nah-nah at a horn-hungry driver in the Paharganj Main Bazaar area. There is a tiny bit of solitude knowing we are not the only ones going crazy. However, there is no solace in the thought of possibly spending 6 months with these attitudes. We need to reassess our travel plans when we get to Delhi. Like Islamabad, it was somehow decided that Chandigarh should be a planned city too. 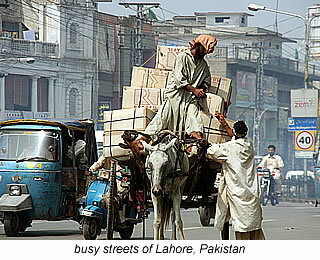 Like Islamabad, it is also an ugly, impractical concrete complex of sectors spread out over too many kilometres. There is no centralised area and absolutely no heart. And just to make things interesting, its designer: Le Corbusier thought he would include roundabouts at every intersection of the city's road grid. Just try explaining a concept that means you have to "give-way" to people coming from one direction to a population who believe religiously in a caste system. Rule number one in India: the biggest on the road is king. Rule number two: if you wear a turban or have a higher social status then you are next on the rung and no roundabout is going to stop either of them from thinking they have right of way. Imagine the confusion then at the round about where a sikh in his spanking new 4x4 is waiting to enter and to his right comes a vegetable seller in a small battered ute a couple of tuk tuks and twenty rickshaw drivers. Everyone coming from the right comes to a halt in the middle of the roundabout so the sikh can push in. I have never seen anything more ludicrous in my life. These supposed traffic flow assistors are a shambles and on a bicycle, you have to remember you are the lowest form of vehicle there is. Rule number three: watch out. The trip into Chandigarh (44km; 116m) is short and purposefully so. 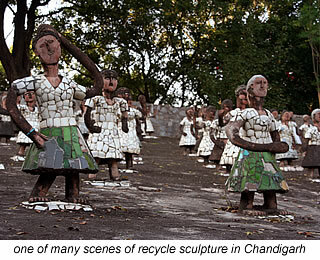 We want to have some time to visit the city's claim to fame: Nek Chand's Rock Garden. It is one of the most unique attractions I have seen in a long while, not to mention a very impressive achievement for the former Engineering Department's Road Inspector. Adding even more to its charm is that this place is one of the few tourist spots in the sub-continent not using a dual pricing entrance fee. (Adult: 10 INDR / Child: 5 INDR). If you are a Gaudi fan like myself, then this place will definitely tickle your fancy as you are lead through a series of small arches that open up into fairy-tale scenes of beautifully crafted bridges and waterfalls. Obsessive wall mosaics of all things discarded - from electrical sockets to broken glass bracelets and creatures of real and fantasy embellish rock terraces. Just for a moment you can forget that you are smack bang in the middle of Le Corbusier's designed urban jungle. Phase 3 of the Rock Garden is where the artistry ends and the commercialism begins. The magic disappears and makes way for food and drink stalls, camel rides, souvenir shops and a centre stage for a group of young boy dancers to strut their stuff. It is Sunday and the family day out. Young and old sit side by side on mosaic terraces cheering the talent in front of them. We wander round the complex for a while and on our return I notice that the cheers are more intense. To my astonishment, these innocent looking lads have taken to smashing fluorescent tubes over their bodies during their dance routine and are chewing on the broken shards like some crunchy chocolate bar. The boys then start rolling on their backs in the glass fragments scattered on the ground. There is blood oozing from everywhere and I turn around to find the same crowds of young and old, still sitting side by side. I think the responsible parenting comment, not to mention the environmental issue at hand are best left to the reader to work out for themselves. I leave the complex with quite a sick feeling in my stomach.